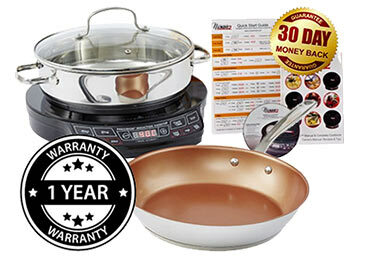 Includes 27cm Duralon Non-Stick Pan, 3.3L Stainless Steel Pot & Lid + More! Now you can select from lower wattage ranges. Select from 900, 1500 or 2000 watts. So not only is it great to use at home, now it is suitable to take away on the road. If you’re a caravan / camper, you can run the PIC Gold on as small as 1kva generator or 1000 watt inverter. Take the ice cube challenge! Induction technology warms the pan, but the PIC Gold remains cool. Adjust temperature via 6 easy presets or in 5 degree increments for precise control. The LCD display shows current temperature and more. The PIC’s precise temperature control requires no hot exposed coils or open flame, eliminating the risk of fire. Spills won’t burn and stick to the cooktop surface. Gas & electric cookers waste energy. Induction heats the pan directly and saves you money. 5º temperature increments allow you to fry with oils at the right temperature and create healthier meals. Save and recall your favourite cooking procedures at the touch of a button for a “set and forget” cooking experience. 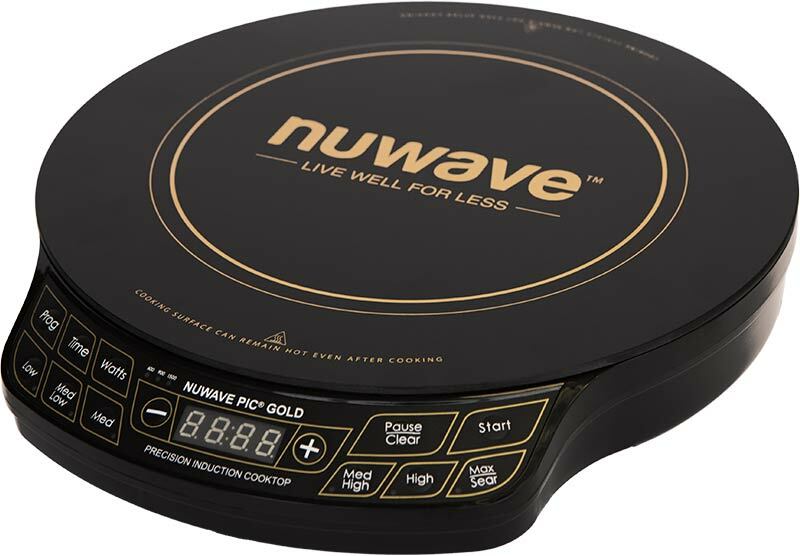 The NuWave Precision Induction Cooktop Gold (PIC Gold) offers precise temperature control with the simple press of a button. With an expansive temperature range, adjustable in 5-degree increments, the 2000-watt PIC Gold can cook as low as 40°C (100°F) and as high as 250°C (575°F). The PIC Gold has three different wattage settings, so you can cook at 900, 1500, or at the full 2000 watts. 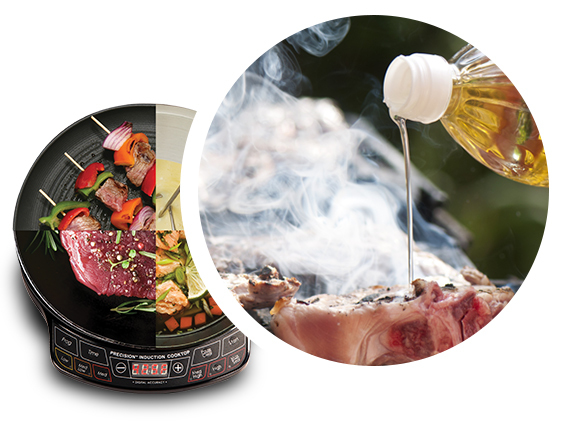 When cooking with the NuWave PIC, you can ensure that your cooking oil never exceeds its smoke point, keeping your delicious homemade meals healthier and tastier than ever before. The NuWave PIC has an incredible temperature range, which allows users to cook any type of food with unbelievable temperature control. While other portable induction cooktops can only cook as low as 60°C (140°F) or as high as 215°C (420°F), with the NuWave Cooktop, you can sear a gourmet steak at 250°C (575°F) or keep a tasty, hearty stew at a warm at 40°C (100°F), all with the same unit! When cooking on a traditional gas or electric stove, you are wasting energy by heating the area around your cookware. The NuWave PIC generates heat directly in the cookware itself, wasting virtually no energy while cooking your food and saving you money on your energy bill. By using no more than 1800 watts, the NuWave PIC conserves up to 90% of the energy wasted by traditional gas or electric stoves. As an added bonus, this induction heating process leaves the PIC surface perfectly cool besides your cookware, making the NuWave PIC the safer choice. When using a traditional gas or electric stove, there’s no way to know at what temperature you’re cooking. You simply have to guess from vague settings like Low, Medium and High, leading to potentially undercooked, overcooked or uneven results. With the precise temperature control of the NuWave PIC, you can achieve perfect results every time by knowing the precise temperature you’re cooking at within 5 degrees. There’s no more guesswork when it comes to the temperature of your cooktop! 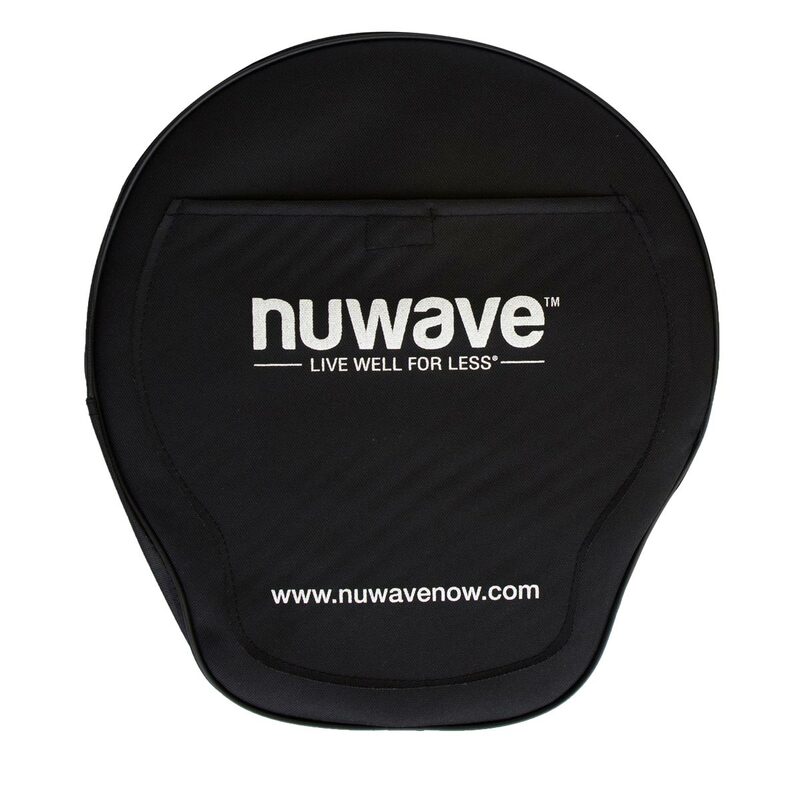 Use the NuWave PIC as a table-top grill or hot-pot! We gave the NuWave Precision Induction Cooker to several families for them to try, and then asked them to talk to us on camera, to see what they thought of it. These interviews were unpaid and totally unscripted, so you can get an idea of what people really think! Julie doesn't get on well with complex technology. That's why she loved the simple temperature based controls of the NuWave PIC, that allow her to get great results all the time! Helen was tired of the lack of control on her Electric Stove, which made cooking a chore. She loves the incremental settings on the NuWave PIC that have allowed her to take control again. Lou uses her NuWave PIC as a portable cooker to cook separate dishes near the BBQ, and now she can't live without the speed and precision. If you only buy one pan, make it the versatile Grill Pan! Adjustable wattage feature to prevent blown breakers when you are using multiple units. Can be set for 900, 1500 or 2000 watts. The NuWave PIC Gold can accommodate a load of up to 23 kilograms (50-pounds) on the cooktop surface. 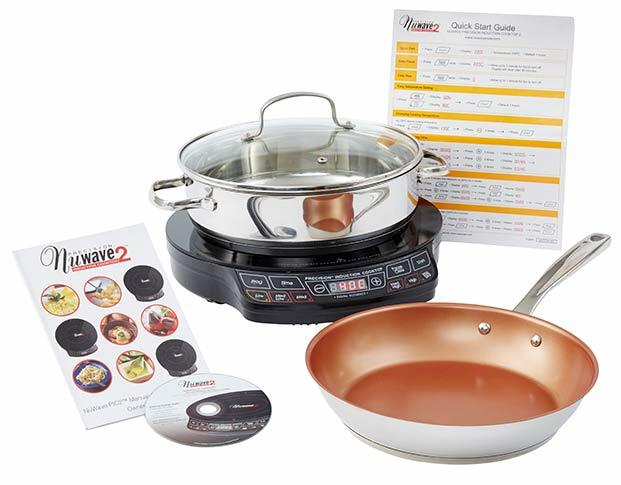 An induction cooktop is comprised of a series of burners called induction coils (based on magnetic principles). These coils generate magnetic fields that produce a warming reaction in steel and iron-based pots and pans. In this way, heat is generated in the cookware and not on the cooktop surface, which is much more energy-efficient than traditional gas or electric ranges. Induction cooking is the most eco-friendly way to prepare meals because the method releases no toxins into the environment. Induction cooking emits no flame, so less residual heat is produced in your kitchen. The NuWave Precision Induction Cooktop 2 remains cool to the touch where the magnetic surface is not activated. Why does Induction cooking need specific cookware? Since induction technology is based on magnetic principles, the cookware used with it must have a ferrous (iron-based, magnetic) bottom. Some types of cookware are made of naturally magnetic metals (such as pure iron), while others are rendered magnetic by “sandwiching” a thin layer of a ferrous metal in the base. This base layer will be affected by the magnetic field of the induction cooktop, distributing the heat. 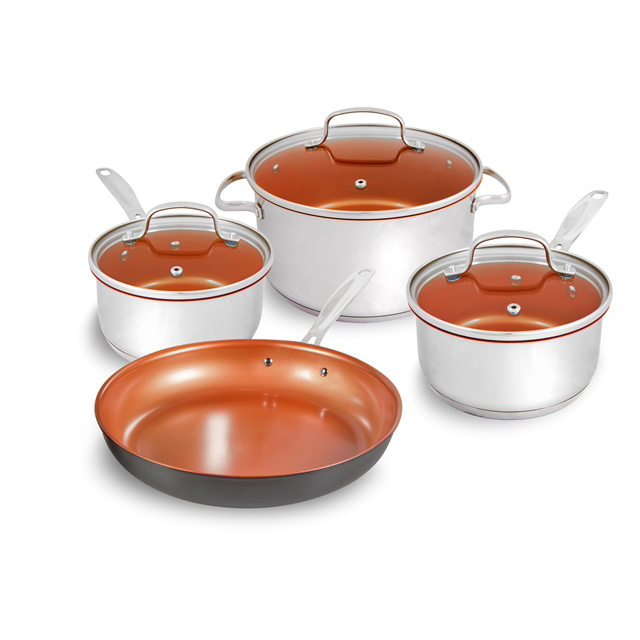 Tri-ply, high-quality stainless steel and cast iron cookware are compatible with induction cooktops. 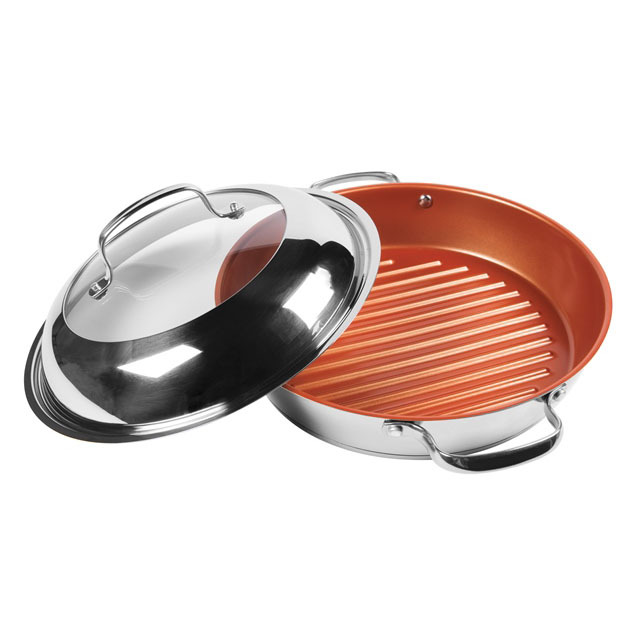 Copper, glass and aluminum cookware will not work unless they have a sandwiched magnetic base. Medium to heavy gauge pots and pans are optimal. 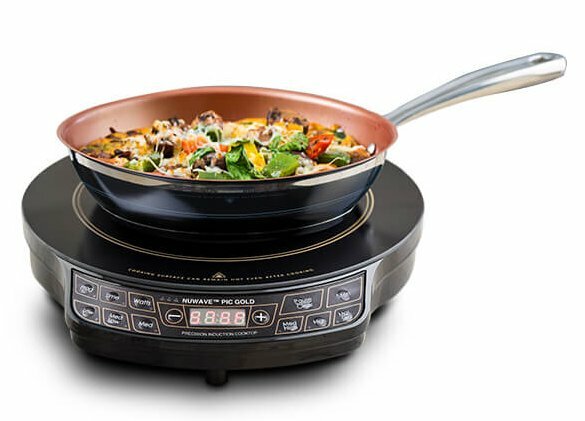 Are my current pans compatible with the NuWave Precision Induction Cooktop 2? An induction symbol will be printed on the bottom of the cookware. Place a small amount of water in a pot or pan. If induction compatible, water will start to boil. A magnet is typically a great indicator. If it sticks to the bottom of the cookware, this typically means the pot or pan is induction ready. However there are instances where the cookware’s magnetic properties may not be strong enough for the pot to work efficiently. When using the NuWave PIC2, which parts will become heated? The heating surface is located inside the appliance’s larger red ring. There are no open flames and the NuWave Precision Induction Cooktop 2 remains cool to the touch where the magnetic surface is not activated. 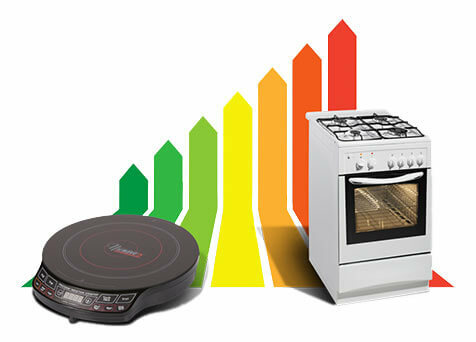 Why is the NuWave PIC2 more beneficial than a traditional gas or electric stovetop? 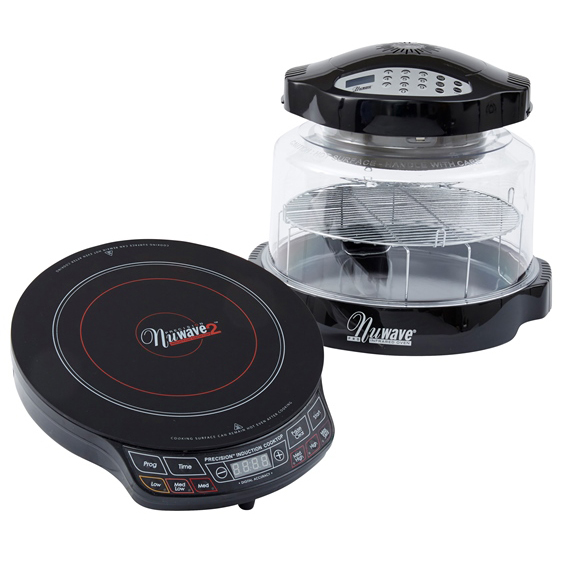 The NuWave Precision Induction Cooktop 2 is efficient, safe, fast and easy to clean. And because you can program cook times and temperatures from warming to searing, almost any food will cook to perfection. And unlike a traditional range, this product is portable. The NuWave PIC2 may be used indoors or out – if anywhere an electrical outlet is available. Take your PIC2 with you when camping or boating. The unit is perfect for college dorms, offices, family gatherings, buffets – the list is nearly endless. How do I know when the NuWave PIC2 starts working? Press “Start.” If an “E1” message is not visible on the display, the pan and the food will start to heat instantly. By pressing “Pause/Clear” the heating process will be interrupted. When you press “Start” it will continue cooking. Is the NuWave PIC2 safe for use by those with pacemakers? Scientific tests have proven that induction cooktops do not pose a risk to health. However, persons with a pacemaker should keep a minimum distance of two feet from the NuWave PIC2 while it is operating. Those who use oxygen should also remain a safe distance from induction cooktops. And as an added safety precaution, aerosol (spray) products should not be used in proximity to the PIC2. While induction cooktops are not recommended for use by those with the conditions described above, Hearthware, Inc., the proud maker of the PIC2, is pleased to inform customers that its flagship product, the NuWave Oven Pro poses no risk to individuals with pacemakers. The NuWave Oven helps anyone prepare healthy, delicious, fast meals from frozen! Can I use the PIC2 for canning? With its ability to accommodate up to a 23 kilograms (50-pound) weight load on the cooktop surface, the NuWave PIC2 is ideal for those who enjoy canning. Also, as the PIC2 may be plugged into any standard electrical outlet, many canners find it convenient to use the appliance outdoors when preparing fruits, vegetables and other foods for seasonal storage. 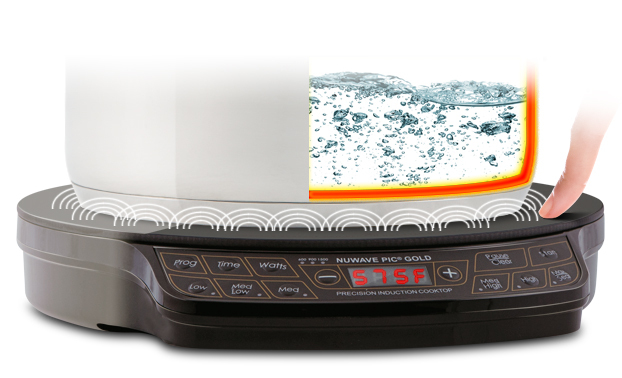 How much wattage is required in order to operate the NuWave Precision Induction Cooktop 2? The PIC2 uses much less energy than a conventional gas or electric range. 1300 watts at the highest temperature setting (Sear) is all you need to enjoy portable, precise induction cooking. The cooktop may be plugged into any standard electrical outlet. For those cooking on the road or open water, operation of the NuWave PIC2 requires 10.83 amps when used on an RV or boat. Please note this information is based on line voltages registering 220-240V. Consult the chart below for wattage use varying by setting. What are the differences between the PIC and the PIC2? The PIC2 features the same great cooking benefits as the PIC, with a few improvements to make this product even better. The PIC2 boasts a larger cooking surface, and the option to cook between Fahrenheit and Celsius for even more precise temperature control. The PIC2 is also programmable up to 100 hours and features a faster auto fan shut off function. What are the temperature equivalents of the six heat settings (degrees Fahrenheit)?